Whoops, you accidentally dropped your iPhone 4 in the toilet again. Too bad there’s no app for protecting the device from corrosive, destructive moisture. There is, however, a physical treatment you can give your smartphone that will prevent permanent damage should it get soggy. 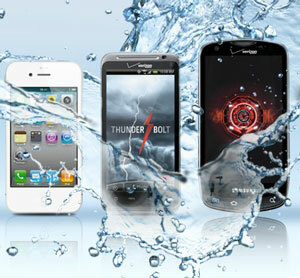 California outfit, Liquipel, offers a treatment that they claim will save your drenched device from total ruin. For $59, they’ll apply a super-thin, water-repellent nano-coating to your iPhone, Motorola Droid, Samsung Charge or any of a handful of different HTC devices. The treatment is designed to last the lifetime of the device and even penetrates charging ports, earphone jacks and speakers. The company discourages users from deliberately dousing a treated device (sorry, bar tricks not recommended), and won’t assume responsibility for damage to a coated product. They do, however, assure that treated devices can safely be brought into steamy bathrooms, used in the rain, and generally prove impervious to wet conditions that would typically destroy the phone. Liquipel might just make fishing the iPhone out of the commode worthwhile after all. To preserve your device's warranty, Liquipel says you must register your device with the company. I was changing a bulb in the cooler and I had to leave to do something more urgent. i heard someone say “hey, there’s an iPhone in this bucket of water!” I started to laugh, and then i went to my phone pocket and had this feeling of terror, no phone there. I go and check, sure enough, it was my phone. I had one of those little rubber scuba suits on the phone, but it was in there just long enough to fry out the circuits. I tried drying it out later on and recharging it, but it’s cooked, cheap phones will be carried at work from now on. Talk about in going in the toilet! I was at my writer’s group meeting. Put my phone on vibrate and stuck it in my bra so if any of my stepchildren called, I would know. At the break, I went to the ladies room. As soon as I sat down, whoop!, the phone slipped out and into the toilet. When I told the folks at the T-mobile story what had happened, they laughed and said no one had ever fessed up to dropping a phone in the toilet before. People were usually vague and just said it had gotten wet somehow. As a female, I frequently have difficulty finding a place to keep my iPhone close at hand. Last summer, I foolishly decided to store my iPhone down the front of my bathing suit—just while I was enjoying the sun, sitting by the pool. A few hours later, I wanted to make a call but couldn’t find my phone. I finally recalled where it was! Yes, it was still there, and had been all during my half hour swim! took it for a swim? My son in law pump septic tanks. Unfortunately he always puts it in his shirt pocket. So when he leans over. Guess where the phone heads to? Then he has to fish it out to get it. Most the time it does’t work afterwards. I set my phone 10’ away from the pool on the fence. It was a safe distance from the pool, and my kids were out helping me close the pool for the season. I had the sump pump going, draining the level down. My son was scooping out the last of the leaves, and set the pole up against the fence. The pole started sliding along the fence, knocking into my phone which was just BARELY over the edge. It knocks the phone on the ground, close enough to where the water was being pumped out- so the ground was wet. Thanks for posting that link. The video does appear to confirm that Liquipel offers protection from generally wet conditions (accidental spills, rain, etc. ), yet is certainly not “waterproof”. Even with Liquipel, anytime you drop your phone into water, we would recommend immediately shutting it off and removing the battery, then letting the phone dry at least 24 hours before attempting to turn it on again. The Motorola Defy had an external case that could be sealed against moisture and was submersible. https://www.techlicious.com/review/motorola-defy-review-tmobile/. Unfortunately, it’s no longer available.